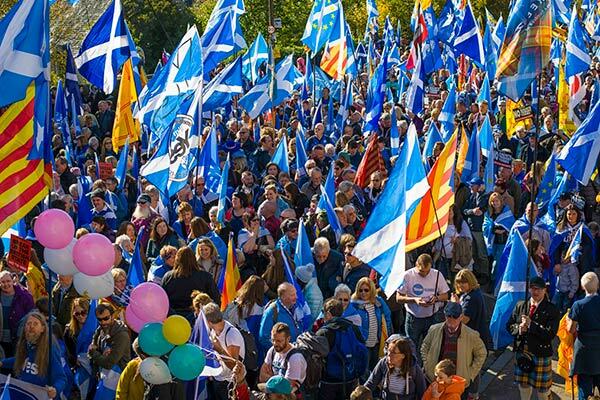 HARD BREXIT – SCOTLAND TRIUMPHS! Imagine Britain goes hard Brexit. The nations are in uproar! Scotland holds a snap referendum and votes for independence and to stay in the EU. Now, every company that is based in London can have an English-speaking UK base if they just up sticks to 400 miles north. The reverse starts happening in Northern Ireland – companies scramble to move south and into EU Eire. WALES SECEDES FROM THE UK and is welcomed into the EU as an independent nation. England now stands alone. Toyota leave, Nissan leave, every major bank moves either to Scotland or France. Every EU-funded research project moves to Scottish universities. There is a huge brain drain and money flume to Scotland, Wales and Ireland. England becomes a backwater, surviving mainly on tourism and Cornish pasties until CORNWALL SECEDES as they never liked the English anyway. Scotland experiences a 21st century re-birth and becomes a cultural, financial and academic hub of Europe. The only fly in the ointment is the wash of illegal immigrants from England. The Scottish President, Adrian MacCormick proposes a wall to keep the desperate, impoverished English hordes out.